Join us now and you’ll get here our 3D printable tabletop RPG, fantasy or wargame related models, props, miniatures and dioramas we create. Being our patron makes it possible for you to get our models at a more favorable price while you’re supporting our work in the same time. A 3D printable smaller cottage, a mausoleum with graves and more! When can I download the files? You'll get access to the files and you'll be able to download them after we write a "paid" post with a new downloadable model and the page charged you for it. Please use the featured tags on the left-hand side to find the post of your reward level that contains the files. What reward level should I select? We print our models, that you can see in the pictures, at 100-micron layer height, 20 percent infill and 200C with PLA. These numbers may vary based on your printer and the material you use, but we design them to look well with these regular settings on every machine. If you want to print them using an SLA printer or a printer that can print at 50 microns or lower then select the $2 reward. With this reward, you'll get the high-res files with much more details that will provide you quality prints. 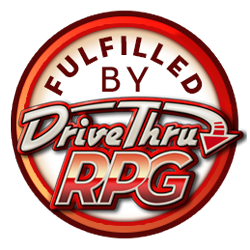 Some of the models will be released at DriveThruRPG, too, if you select the $5 reward we will send you a link to them, this way you don't have to keep your models on your hard-drive or manage another page account. Also, you'll get some extra parts and links to previous releases with this reward level. We release our products under the CC-BY-NC license, which means you can modify, use, and display these models for personal use. You cannot sell the digital and/or printed copies or earn money with them. If you share them on other sites or group please mention this page where others can also get the models. Thank you! For Commercial license please select the $15 Merchant tier. This waives the "Non-Commercial" stipulation attached to our designs (released or sent out via Patreon), though we would still like attribution in text on your Etsy, eBay, or similar storefront posts where applicable, and the item must be a finished, 3D-printed product (not a re-sale of a digital file). You get the rights to make money with your prints. Casts (series production) are not allowed, only 3D printed models. *Painted D&D minis are for scale and not included. We are Antal Kéninger and Sándor Balogh, graphic artists from Central Europe. We are the guys behind Black Scrolls Games (BSG) Miniatures. We've been in the tabletop game business for seven years, working with other publishers and releasing our own stuff. Everything you can see here is designed, sculpted and painted by us. $1 = Get all the models! Get the 3D printable models we release here on Patreon in high-res STL format (around 100-200K polygons / models). It will be ideal for printers that can print under 100 micron or if you want to resize them. You get everything from previous tiers plus the right to make money with the printed copies of our models commercially. You can sell the printed models via etsy, ebay, or on any sites without modification as long as you are signed up for this tier. Please read description for more info. If we reach this goal, we will create and release a smaller set of hex caverns terrain and probably some monsters, too.